Pastor Dan O’Deens of the Gateway Grace Community Church near Philadelphia lives in Coatesville, PA, where a string of arsons has made national news. Here is an excerpt of a news story and photo–to read the entire article click here. Pastor O’Deens gives some of his personal observations and involvement following the excerpt. 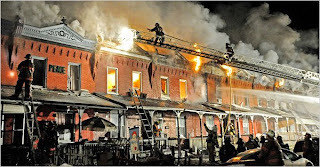 COATESVILLE, Pa. (AP) — The latest in a string of suspicious fires in this Philadelphia suburb tore through a block of row houses over the weekend, damaging 15 homes, leaving several dozen people homeless and prompting city officials to declare a state of emergency. At least 30 arsons have been reported since the beginning of last year, about half of them in the last three weeks. The police said the fires might be part of a gang initiation, but there was no clear information about who was committing the crimes or why. The latest fire was reported late Saturday at the back of one house, and it quickly spread to adjacent homes. After a long day, preparing to move into our new church building I got home late, went to bed only to receive a phone call from the Red Cross. Another FIRE! You have to be kidding me! This is the 29th fire in one year. The 15th fire since January 1st. According to the Daily Local, ‘the latest in a long line of arsons that authorities say may be linked to gang initiations.” On Saturday evening, 15 more homes were destroyed. Dozens are homeless, over 1.8 Million in damages at ‘first’ assessment. Coatesville has been declared a State of Emergency. I personally represented the Red Cross throughout the night helping families find hope. We were able to give the people affected by the fires, residence for 3 nights in hotel accomodations and monies sufficient to care for meals and clothing and coates to get them back on their feet. The hard truth is that most of these folks have ‘nothing’ to come back to. The area churches held a meeting on Sunday evening to consider what we can do to help these families for the long terms. We are early in the process of organizing our collective resources. A fund has been established. If you wish to assist these families specifically you can send checks to “Gateway Church.” 100% of this money will make it to these families. Many of our families live in Coatesville. They are afraid. They are losing hope in the police and City officials. Prayer is critical. We need to find who is behind this and bring peace back to a community that deserved better than what they are experiencing. Thanks for your prayers on behalf of these families and all those who are working hard to find solutions to best serve all the families affected by these horrific tragedies.